During a visit to the Stung Meanchey Center, a school bordering Phnom Penh’s municipal garbage dump, one young student ran spontaneously towards Phymean Noun, the school’s founder, and lept into her embrace, kissing her on the cheek. When the other students at the middle school saw this, they surrounded Phymean Noun and within moments, dozens of students were laughing and smiling as they sought her embrace. Phymean Noun’s schools have provided these students not just with occupational skills but affection and hope. 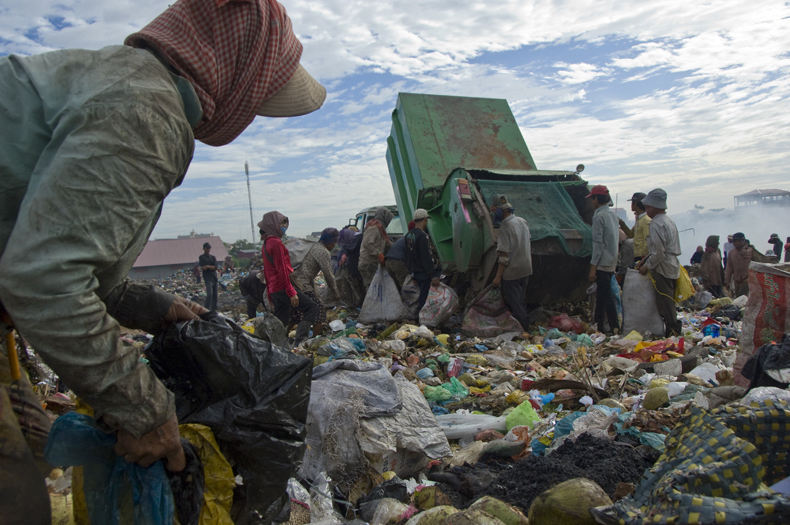 Five years ago, Phymean Noun opened the Stung Meanchey Center for children working and living near the Phnom Penh dump, and for her efforts, CNN has selected her as one of the Top Ten CNN Heroes from over 4,000 entries from 75 countries. On November 27, CNN will announce its “Hero of the Year” during a show hosted by CNN anchor Anderson Cooper. The winner will be chosen by a public vote and will receive an additional US$100,000. Many of the children at Stung Meanchey Center still work at the municipal dump for less than a dollar day when they are not at school. Before the Stung Meanchey Center opened, few of them had shoes, let alone access to education, but Phymean Noun believed that education could be their tickets out of poverty, as it was for her. “Without education, poverty will continue nonstop from one generation to another. I always tell them about my life to show them that they can be successful. The world can change with educated children,” she said. Before she founded the People Improvement Organization (PIO), Phymean Noun had overcome her own difficult youth. Orphaned at age 15 and left to raise a three-year-old niece in poverty, she eventually ended up landing a high-paying job at Untac. “I was successful. I had comfortable life and a nice car,” she said. Then one day in 2002, she was walking along the riverfront eating a piece of chicken. When she finished, she threw the bones in a trash heap and watched as children scrambled over the rubbish for her scraps. Instead of ignoring what happened, she called over the kids, sat in the grass with them and talked. They told her about their families, their daily lives and why they did not attend school. That night, Phymean Noun tossed and turned as she thought about the kids. By morning, she made the decision to quit her job and devote herself to helping kids like the ones she met on the riverfront. A year later, she opened a school next to the municipal dump. “The conversations with the kids transformed my life. I saw these kids, and they reminded me of myself,” she said. But the first two years of the Stung Meanchey Center were “tough”, Phymean Noun said. She spent over US$30,000 of her own money establishing and running the school. In the early days, Phymean Noun had to go to the dump every day to persuade the parents to send their kids to her school, even bribing the parents with rice to let their kids attend. Today, PIO runs three schools and a vocational training centre, and Phymean Noun is forced to turn away some of the kids who want to attend – one of the things she hopes to change if she wins the $100,000 grand prize. Through the schools, PIO provides nutritious meals, uniforms, shoes and basic health care. In addition to studying basics of reading, writing and maths, the students can learn Apsara dancing, computer skills and beauty salon techniques. They have opportunities to decorate the school themselves. Kelly Flynn, the executive producer of CNN Heroes, explained why CNN chose Phymean Noun over other contestants.